Frankie & Tony’s sandwich shops (NE1 8JN) and (NE1 5XN) have long been a favourite of mine – perfect for when you need a quick, filling and reasonably priced bit to eat. Their range of sandwiches isn’t going to win any awards for originality, but all the classics are represented, and all come under three quid. Nothing too fancy, no fancy gourmet deli ingredients, just big ol’ honest sandwiches that’ll fill you up better than a couple of Gregg’s pasties – and probably cost less given the the recent budget. If you visit the Ridley Place shop, you’ll notice the queue is always out the door and halfway down the street, always a good sign. It’s usually quieter in the shop just off Charlotte Square, but haven’t noticed a difference in the sandwiches. 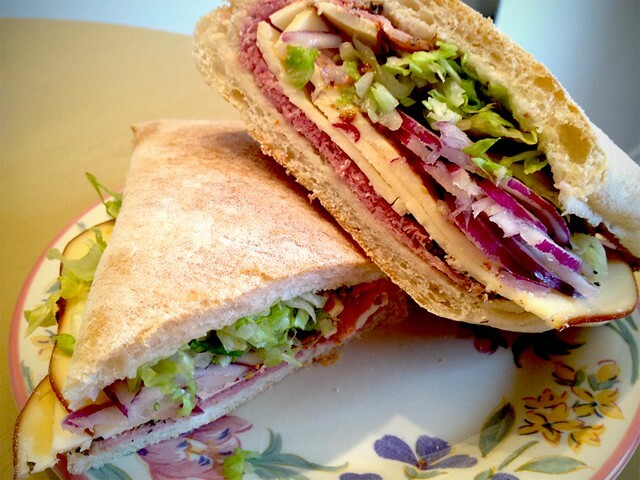 Today I went for a personal favourite, thee Swiss New Yorker (above) – smoked cheese, pastrami and wholegrain mustard. I did feel that recently compared to my university days where F&T’s was my daily haunt, that the toppings were somewhat less plentiful, but this is still a hefty sandwich nonetheless. Quickly made, always fresh, it’s good to see at the entrance a proudly displayed “5 stars Scores on the Doors” sign. The breads are mostly great, whether that be a poppy knot, cheese bread, or our personal favourite “italian ciabatta” (pictured). If you go for something like chicken tikka (recommended!) and all of the salad, the sandwich is easily gonna dwarf your mouth. Which we like! So rather than going for a soggy, cold and flaccid M&S packaged sandwich, or (shudder) an overpriced pret a manger creation, give either branch of F&T’s a go and you’ll definitely get a good sarnie for less than three quid. Win win.